This lovely certificate was sent to me by fellow researcher Steven Addair. Steven's sister Colette Addair Tarver went to Scotland about two years ago and brought the blazon back. Steven is researching the following lineage: Father-Henry Addair; Grandfather--Thomas Addair; G-Grandfather--Henry Addair; GG-Grandfather--Moses Addair b 1830 or 1834; GGG-Grandfather--John Adair; GGGG-Grandfather--James Adair b 1752? Not sure; GGGGG-Grandfather--unknown. Name seemed to have changed during Moses Addair's early life. Not sure why. My thanks to Steven for this submission! Crest: A Man's head affrontie, couped at the neck and distilling blood. Authority Woulfe gives the Irish O'Daire as the descendants of Daire (same as the Latin Darius, meaning King); while Black's Surnames of Scotland says Adair and Edzear were the same name, both forms being found on the same page as late as 1625. Mr. Black feels certain that these are a form of Edzear. He also does not believe the tradition that Fitzgerald of Adare, fugitive son of Fitzgerald, Earl of Desmond and Adare of Ireland, founded the family in Kinhilt, Scotland, around 1388. There is earlier evidence of the Adairs in Scotland. The arms described above are the arms of Adair of Kinhilt, County Wigton, Scotland and Ballymena County, Antrim, Ireland, according to Authority Papworth. This Adair of Kinhilt uses the arms exactly as above, except that it does not include the lower motto, "Moribus Victoria Dextris". We would assume that this motto was added later, perhaps by this American branch of the family. The red hand was found all over the world, even among the American Indians and on the walls of the caves of the prehistoric Cro-Magnards. It means strength, force, and health. 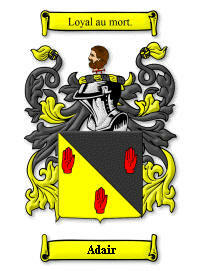 In these arms it probably does have an influence from Irish sources, perhaps more from the traditional story of the Irish chieftain who cut off his hand while racing through the surf and threw it to the shore to claim first grasp, and thence first choice of the new land of Ireland that they were just approaching. The same source was the origin of the famous Red Hand of Ulster used by baronets who settled there in later times as homesteaders (but Adair was there before the "Red Hand of Ulster-users"). The crest of a bearded and bloody head probably commemorates some ancient hand-to-hand encounter, or perhaps the capture and execution of some enemy chieftain. It may stand for some ancestral exploit in the Crusades (see explanation of colors). The Irish generally cut off the heads of chiefs they had slain in battle, as they considered no man actually dead until his head was cut off.. The Colors Argent with ore (silver with gold) indicates the will to avenge Christ's blood. Argent with gules (silver with red) means honest boldness. Ore with Gules (gold with red) shows a disposition to shed one's blood to acquire riches. Family record report that these arms were quartered with Shafto--that is, the Adair arms and the Shafto family arms both be shown on one shield, the shield being divided into equal quarters. The records do not show in which two quarters the Shafto and Adair arms go, nor whether there may be one or two others also quartered--as we are left with two empty quarters with this description. Strictly speaking, a quartered shield tells who a man's mother was and is shown because she in an heiress and the last of the family line. A present-day Adair using the arms with the Shafto devices would be declaring that his mother was a Shafto, which does not apply in this case, and would not be authentic for future generations. Arms were sometimes shown quartered in this manner on a slate tombstone--but even this was unusual. Note: Author Ellis of Who Are You? gives "Argent a lion rampant azure between three hands gules" as the arms of the Scotch-Irish Adair of Maryland, New Jersey, Pennsylvania, Kentucky and South Carolina...with crest a bearded head on the point of a dagger dripping blood. 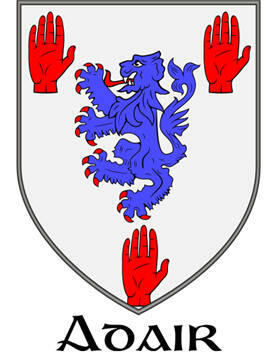 Here we see a very similar coat-of-arms, with the exception of the shield being all silver, and in the center, a blue lion between the familiar three red hands. The blue lion is of great interest to Genealogist Joseph Ferrier, as it is almost always a Welsh symbol. There are many heraldic lions, but few blue ones. Historically, the Welsh heralds established these arms, already in use, in the systematic way sometime around 1200 AD at the time of the early Tudors. The Welsh-type coat-of-arms may have been the forerunner of the one described in present records of the Adair family. The Scotch-Irish Adairs may have dropped the blue lion because it was so definitely a Welsh symbol. 1. "Authority Woulfe gives the Irish O'Daire as the descendants of Daire"
In fact, O'Daire is an Irish name in its' own right and while often Anglicized as Adair, is not related to the much more numerous Adair name of Scottish origin. 2. "The red hand was found all over the world, even among the American..."
In heraldic terms, the severed red hand is almost exclusively Irish. 3. "The Blue Lion ...is almost always a Welsh symbol"
This is simply not true, there are many, many examples of the "lion rampant azure" among Irish coats-of-arms.